This giant grows in the center of the lawn between Rand/Sarratt and Garland Halls. It is part of a four-way tie for largest tree in the arboretum, and is massive in every way. It has a diameter of 149 cm (almost 5 feet) and an incredible 30 m (98 ft) crown spread. Its largest lateral branch is longer than the height of most trees on campus. The tree is actually wider than it is tall (height=25 m or 82 ft.). This is undoubtedly the most famous tree on Vanderbilt campus and the only one that has its own plaque on the ground in front of it. It has been recognized as over 200 years old and is described on p. 38 of The Trees of Vanderbilt. It is the only tree on campus known conclusively to predate the university. Bur oak is one of the more distinctive oaks. Its leaves have rounded lobes, but the sinuses (indentations) are uneven. The sinuses near the leaf base may reach almost to the midvein. The acorns of bur oak are unmistakable. Their caps cover most of the nuts and have long fringes along the edge. Bur oak is not particularly common, but it is found throughout middle Tennessee. Although this tree is impressive, it doesn't have any branches near the ground, so you will have to look at another example to get a better look at the leaves and twigs. This organism is a living specimen that is part of the  Vanderbilt University Arboretum  with the local identifier 2-691. It has the name "Bicentennial Oak". 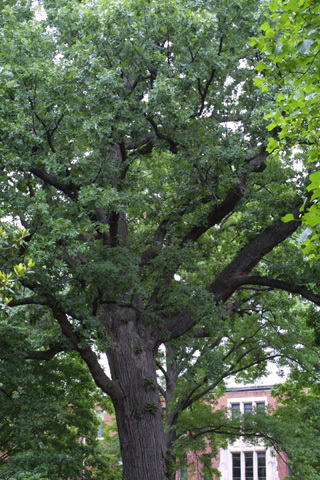 Remarks: This tree is known as the Bicentennial Oak and was recognized in 1976 by a plaque as being over 200 years old.